The Polycom RealPresence Group 700 1080p gives users productive, efficient meetings even when everyone can't be in the same room. Many environments will demand the use of multiple displays and switching between content sources to deliver the most productive video meetings, and the Group 700 does just that. The Group 700 1080p allows you to choose from a variety of configurations and easily switch between many different content sources throughout your meeting. The Polycom Group 700 features an incredibly simple user interface, designed for ease-of-use even for first time users with no training. This allows for the reduction of IT support costs while encouraging adoption and increasing usage. 1080p60 resolution brings a new level of clarity to video communications, removing many of the limitations previously encountered when sharing videos, design animations and other content that needs both high resolution and a faster frame rate. The Group 700 1080p is standards-based to ensure interoperability with the millions of other standards-based video conferencing environments. The Group 700 features an 8-way multipoint bridge for connecting more users to calls. Native interoperability with the most popular UC platforms helps you streamline the integration of video into your communications processes, without using additional gateways. 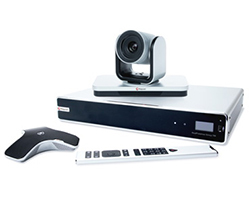 The Group 700 1080p also offers the Telepresence Interoperability Protocol, for connecting to non-standards-based Cisco environments, and SVC architecture* which provides video calling between existing video systems as well as new SVC systems.